Some teams start a contest like a house on fire. By comparison, the Bulldog netters had the whole block burning Saturday at Bulldog Pit. With the 2017 District 4-AAAAA Tournament championship on the line, the girls in orange charged out to a quick 2-0 lead by way of 25-15 and 25-8 wins. The ‘Dogs were on point, and the Rockets were on their heels. But after earning their spot in the title bout by way of a 3-2 win over second-seeded Roswell High Thursday, Goddard wasn’t about to fizzle so easily. As Artesia began making their first real mistakes of the night in Game Three, the Rockets were there to make them pay. And although the Bulldogs had their chances to overcome in the end, for the first time in four meetings this season, they headed to Game 4 against the girls in blue. The early goings were close, and Goddard managed to stay within striking distance for most of the contest. But with the trophy in their sights, the Artesia girls buckled down and did what it took to grab it. By a final of 3-1 (25-15, 25-8, 20-25, 25-19), the ‘Dogs added the D4 Tourney crown to their regular-season win and improved to 19-2 on the year as they await the Class 5A State Tournament seeding and selection. “Those first two games, man alive, I don’t think we did anything wrong,” head coach Alan Williams said following the match. “We didn’t miss a serve till the third game. I was really impressed with how well we played. With three quick service points from Kyrah Gonzales, punctuated by a pair of Stacia Martinez kills, the ‘Dogs got out to a quick start Saturday. Four points from Martinez, including an ace and two blocks from Malori McSpadden, made it 8-1, and although the Rockets were able to inch back within two, a six-point service from Bailey Pearce widened the gap, 18-10. From there, the squads traded side-outs, with Paityn Houghtaling, Pearce and Mattie McCombs logging the kills necessary to bring about game point, which was served up by Elliot Harrison, 25-15. 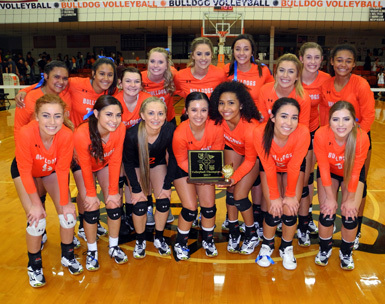 The ‘Dogs presented an even more dominant front in the second set, with Gonzales once again getting the ball rolling with three and Alexa Riggs putting it firmly in Artesia’s court midway through with six straight, including a pair of aces, two kills by McCombs, and a resounding spike from Peace. Up 12-3, Artesia needed only maintain from there, with Harrison and Pearce combining for six points and three aces, and McCombs continuing to find the gaps from the outside. She’d deliver game point from the line, as well, which was secured by a Harrison hit. The Bulldogs had a bit of trouble re-finding their rhythm in the third set, however. Goddard got on the board first, and although kills from Martinez and McSpadden kept them from rallying, Artesia – with the exception of an early pair from Riggs – could not produce offensively. As such, the Rockets were able to simply hold their four-point lead through transition after transition en route to a 12-8 lead at the halfway point. Martinez finally added two service points for the ‘Dogs to make it 12-11, but despite solid hitting from Pearce and Gracie Puentes, an ace here, a hit into the net there, and a block into the net besides all added up, keeping the Rockets in the lead. With the score at 23-19 late, Pearce was able to put Artesia back on offense with a chance, but a mishit returned the ball to Goddard, and a block ended the game, 20-25. “I think we lost a little bit of our energy,” said Williams. “It puts you maybe a split second behind on everything. In that third game, we started missing serves, too. While Game 4 also began as a side-out see-saw, Riggs was able to deliver a pair to put Artesia in front, and McCombs finally gave the Bulldogs a cushion midway through on a four-point service that made it 13-6. A few defensive miscues kept the Rockets hanging around, as close as 19-17 in the late stages. But a Puentes kill put Gonzales at the line, who served up a pair to make it 22-17. The next attempt went into the net, but McSpadden pounded one past Goddard for a first side-out, then logged a solo block for a second to call up match point, subsequently delivered by Riggs, 25-19. “Pick up the energy and things will go well” was the message Williams and his staff had for their athletes between the third and fourth sets. Martinez and Pearce finished the match with nine kills apiece Saturday, followed by McCombs with seven. McSpadden delivered four blocks, Pearce and Riggs a trio of aces each, and Riggs led the team in service points with 11, followed by Gonzales and Pearce with 10. The Bulldogs were seeded second in the Class 5A state playoffs Sunday and will begin pool play against No. 7 Roswell High and No. 11 Bloomfield Thursday morning at the Santa Ana Star Center in Rio Rancho.